Refight the first day of Gettysburg with this great Officially Licensed terrain mat brought to you by Cigar Box Battle and Osprey Publishing! This mat measures 56"x76" and represents the first day's fighting at Gettysburg to the center north and west. This mat covers the intense fighting around the Chambersburg Pike, McPherson's Ridge, Seminary Ridge, Oak Hill, Gettysburg, and Mummasburg Road. This is the original artwork contained in the "Across A Deadly Field" scenario book " The War in the East". The artwork was designed by Todd Davis and the author, John Hill. 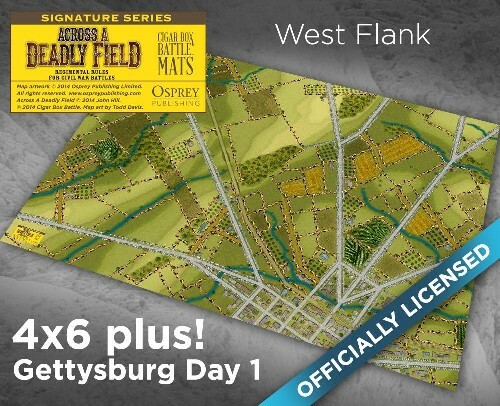 This mat features all of the terrain around Gettysburg, including roads, fences, woods, buildings, etc. All you have to do is roll this mat out on a table, add your troops and you are ready to play! This mat looks even better with cardboard hills placed underneath, and 3D woods and buildings placed over the images on the map. We recommend this mat for use with 10mm, 15mm or 20mm figures.